Entire Star Wars library available in e-book form! 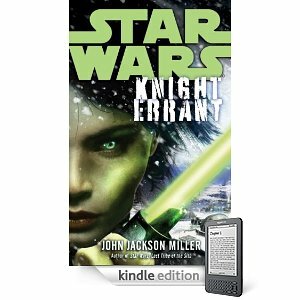 As noted here earlier, Random House/Del Rey and Lucasfilm recently reached an agreement to put the entire Star Wars fiction backlist into e-book form — and now you can order my Star Wars: Knight Errant novel in e-book form, as well as all the others! You can preorder it from Amazon for Kindle, and also from Barnes & Noble for Nook. I'll be talking about my Star Wars work and signing from 11 a.m. to 1 p.m. on Saturday at the Appleton Public Library in Wisconsin. Del Rey has sent along a nice prize for a drawing, as well. The library is at 225 N. Oneida Street, Appleton, WI 54911. Saturday is already Star Wars day in Appleton, with the Brewers' single-A club, the Timber Rattlers, having their annual Star Wars Night later in the evening, complete with the 501st. I went last year and it was a lot of fun. If you're in town Saturday, you can make it a whole day of Star Wars!